World War One formally ended in 1918, but in 2019 Australians will also remember the centenary of Repatriation, the enormous task of returning soldiers from the battlefields of Europe and the Middle East, restoring these men to health and providing information to the families of the many who perished without a trace.Fittingly, Monash University, named after General Sir John Monash who oversaw the Repatriation effort, last year commissioned Christine Johnson to create artworks in remembrance of five pharmacy students who were victims of World War One. Christine has created Remembrance and Emblem artworks to honour each student. 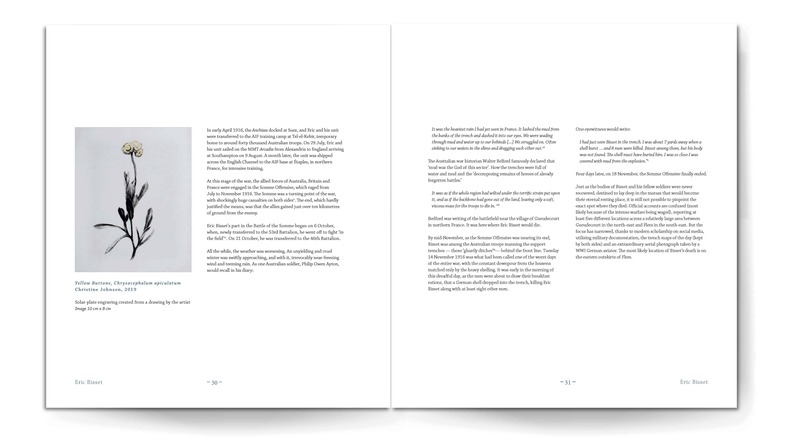 Fox Galleries is proud to have participated in this project by publishing a monograph ‘Five Soldiers: Untold Stories of World War One’, to pay tribute to the lives of four of the students whose lives were tragically cut short and to the one student who survived the horrors of the war, but succumbed to its memories less than a decade after the Armistice. On Tuesday, 30 April a special event, Untold Stories of World War One: Posthumous Awards to Pharmacy Students and Sir John Monash Remembrance, will be held at Monash University, Parkville Campus in Melbourne. The powerful, fascinating and intertwined stories of the Five Soldiers, which strongly resonate today, arose from a research project the Faculty of Pharmacy and Pharmaceutical Sciences undertook to coincide with the centenary of the conclusion of World War One. The Faculty, through its predecessor institution the Melbourne College of Pharmacy, established in 1881, predate the 1958 establishment of Monash University. Pharmacy is the only discipline within today’s Monash University with a direct linkage to World War One, and which had the opportunity to personally engage with Sir John Monash. Fox Galleries would like to thank The Faculty of Pharmacy and Pharmaceutical Sciences for this unique opportunity to bridge history, art and botany; in particular Professor Dean William Charman and Business Manager Andrew McIntosh. 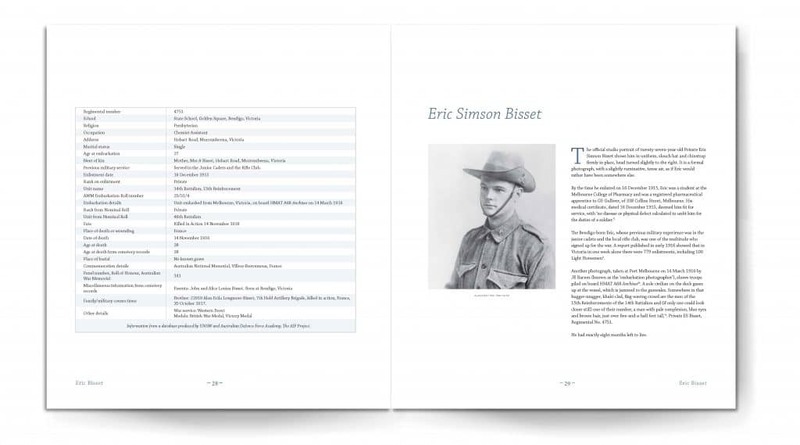 I would also like to thank Baldessin Press, Ellikon Fine Printers and acknowledge author Michael Shmith for his evocative conveyance of the lives of the Five Soldiers. Quoting Wilfred Owen and referencing Christine’s artworks, Michael narrates these stories as ‘the pity of war distilled’. The perishable nature of flowers is a metaphor for the fleeting quality of life. The first of the five soldiers I came to know about was Alan Couve. He was the brother of Eileen Ramsay (née Couve), a little known but important botanist. It is Eileen’s botanical collection that has informed my artistic enquiry in recent years. Both of Eileen’s brothers were killed at Gallipoli and the loss left an indelible mark on the rest of her life. It was no accident that the daughter of a pharmacist should be interested in botany. After all, the very history of pharmacy is itself botanical. Therefore, I have chosen flowers to intertwine into a double symbol for these five young men of the College of Pharmacy whose promising lives were cut short by the war. The flowers are both symbolic of their link to the College of Pharmacy and are tokens of remembrance. 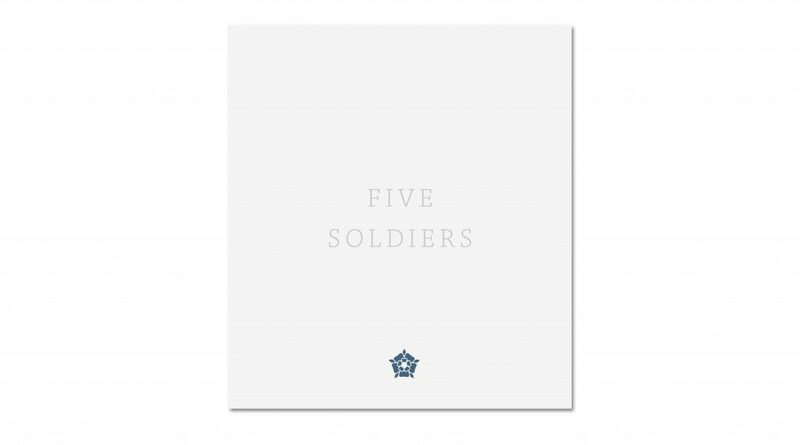 Just as one would offer a flower as a tribute at a graveside or light a candle in church, I see my work as a gesture by which to mark the brief light of the lives of the five soldiers. Only through recounting and remembering each of their stories can we contemplate the unity in human existence of life and death. In aesthetic terms, the wildflowers of the European battlefields when compared with those of Victoria’s regional areas are, however geographically or botanically divided, of delicate and yet robust beauty, able to survive harsh conditions. I have chosen a single wildflower to represent each soldier. The cornflower has a noble pharmaceutical lineage, having been used in herbal medicines in Europe for centuries. There is also a direct military significance, as bleuets (cornflowers) are worn by the French on Remembrance Day. This reflects the Couve family’s French-Mauritian heritage. Sunny Yellow Buttons grow profusely in the Faculty garden and their cheerful faces made me think of Bisset’s youthful and sensitive gaze. I imagined him with his numerous brothers and sisters growing up in country Bendigo. Its delicate tracery reminded me of the old-fashioned practice of pressing flowers and enclosing them in letters. 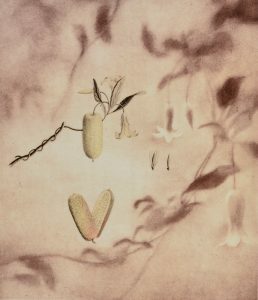 Many items of wartime correspondence contained pressed flowers as mementos or as tokens of tenderness. The Austral Indigo is one of many endemic species growing in Jewkes’s home town of Ballarat. I have chosen the Tea tree flower to mark a stark contrast to the unspeakable suffering and wretched conditions of 4 October 1917, the day Malcolm Jones was killed at Passchendaele. The plant has a bright open flower; its five small petals radiate out with the sweet innocence of arms-open-wide of a child. This native hibiscus thrives in swampy ground. It has delicate pale-yellow petals and a deep crimson heart. Not only did Frank Cahir survive Gallipoli, he also endured the muddy horrors of the Western Front and returned to the battlefields after the war to help exhume and identify the fallen. The Remembrance artworks (32.5 cm x 29 cm, edition of 5) combine a background layer over-printed with a solar-plate engraving of each flower. Underneath each flower lies an image of a landscape or a reference to the time and place of death of the soldier. Although, in Frank Cahir’s case, the landscape is of Gallipoli where he began his heroic odyssey. The Flower Emblems (10 cm x 8 cm, edition of 50) are tokens of remembrance for each soldier. All the drawings have been created from specimens from the Bush Medicine Garden at the Faculty of Pharmacy and Pharmaceutical Sciences, Monash University (Parkville campus) my own garden and the Maranoa Native Gardens in Balwyn. Solar-plate engraving and archival pigment print created from drawings by the artist. The background landscape takes inspiration from a watercolour by British war artist Norman Wilkinson depicting the Anzac Cliﬀs landing point of Australians and New Zealanders on 25th April 1915. On the left, a naval hospital ship, on the right bursts of Turkish shells amongst the dredgers. Solar-plate engraving created from a drawing by the artist and archival pigment print of the trench map of the area near Gueudecourt in France where Bisset is thought to have died. Solar-plate engraving created from a drawing by the artist and archival pigment print reproducing the letter Jewkes wrote to his parents the night before he was killed. Solar-plate engraving and archival pigment print created from drawings by the artist, landscape inspired by war photographer Frank Hurley’s controversial composite image, Over the top. Solar-plate engraving and archival pigment print created from drawings by the artist. Solar-plate engraving with chine-collé created from a drawing by the artist.